And the Madeleine goes to…. The contestants are on stage for the annual Madeleine Award for the use of symbol, stunt, prop, gesture or jest in international affairs. The previous column  announced the minor prizes: the OOPS (I wish I hadn’t…) and the Diana for photograph or image. 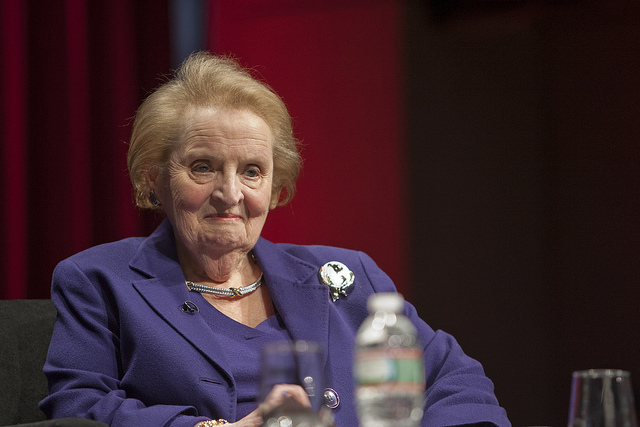 Now, the main award (named after Madeleine Albright for an innovation in the Secretary of State dress code by sending diplomatic messages via brooches on her lapel). Previous winners  of the Madeleine include a cabinet meeting underwater to highlight climate change and a brilliant bluff to get a peace deal. Last year’s winner was Margaret Thatcher: both for being Margaret and a specific Madeleine moment . Mrs T hosted a Downing Street dinner for the French President, arranging the seating so the French leader would see ‘on the wall opposite a full-length portrait of Lord Nelson next to a full-length portrait of the Duke of Wellington’. Now to this year’s contestants. In the power game, entourage matters. The more costly courtiers, the better. As so often, Hillary understands. She’s travelling towards the presidency but she doesn’t travel alone. What Hillary demands  before she’ll turn up to take $250,000 for a speech isn’t just the jet and the presidential suite, but all the aides and the advance staffers as well. Clinton could give advice on the symbols of office, floor space and power clichés to female ministers in the British government. This wonderful piece  (‘Size isn’t everything’) on research that found British female ministers are given a lot less office space than male colleagues, and sometimes even less than men who are junior to them. The most important thing I have to say to you today is that hair matters. This is a life lesson my family did not teach me, Wellesley and Yale Law School failed to instill: Your hair will send significant messages to those around you. What hopes and dreams you have for the world, but more, what hopes and dreams you have for your hair. Pay attention to your hair, because everyone else will. Margaret and Hillary agree: the tresses always talk but mustn’t dominate the conversation. So it’s that efforts at a winning appearance—in every sense of winning—produced two of this year’s finalists, from Indonesia and India. It was in a checkered shirt that a mayor from Central Java walked the streets in his bid to become Jakarta’s governor. Now, after a year and a half as the capital’s leader, Joko Widodo has brought back the red-and-blue checks to run for the presidency. In a Muslim-majority country where voters are accustomed to seeing politicians wear conservative religious attire or formal, patterned textiles, the relaxed checkered shirt immediately caught the attention of young, fashion-forward Jakarta voters. Narendra Modi also knows that clothes maketh the man. Modi crafted a fashion statement  that serves as a political message— a rendering of the classic Indian tunic with half sleeves. After Ghandi’s dhoti, Nehru’s jacket, Indira’s sari, now the Modi Kurta. Australia’s counter to the Kurta is Koala Diplomacy . Oz diplomats have started to formalise the use of koalas as ‘soft power diplomatic strategy, with a 600-page manual having been drawn-up by the Foreign Affairs Department and the marsupials increasingly being given to regional allies’. If the use of chocolate Caramello koalas to gain 140 votes at the UN General Assembly hadn’t already won  a Madeleine, cute and cuddly Koala Diplomacy would be in with a chance of taking the biscuit. The true Madeleine moment was the US confirming  that in reaching out to Havana, ‘it helped a Cuban spy imprisoned in California artificially inseminate his wife back in Cuba’. Rate this as putting sperm into a new permanent diplomatic embrace, helping human relations in the interests of the relationship. All those are worthy finalists, but the judges had no trouble agreeing on the obvious winner of the sixth Madeleine Award. 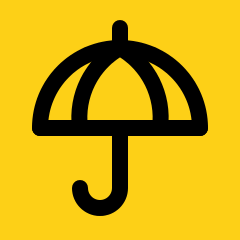 We unfurl the clear victor—the umbrella of the Hong Kong protests. The name the Umbrella Revolution  was applied in September, inspired by the use of umbrellas to defend against police tear gas. Not the least of the achievements of the Hong Kong protests is that China’s leaders are going to have to avoid umbrellas. Standing beneath an umbrella—sheltering rendered as submitting—will be a dangerous political look. Good symbols change meanings. A Madeleine Award for the Hong Kong umbrella. Graeme Dobell is the ASPI journalist fellow. Images courtesy of Wikipedia  and World Bank Photo Collection .